Using modular acrylic panels, CNS Displays has developed several designs that provide unique, next generation wall mount shoe displays. These versatile shoe display panels come in various sizes and finishes and are installed easily with our proven stainless steel standoff system either directly on the wall or on a wooden panel of your desired finish, which is wall mounted with Z-brackets. The highly innovative and contemporary counter top or wall mount shoe displays by CNS Displays combine the latest in intelligent display hardware technology with an ultra-modern design to make a truly convincing statement in your shoe retail store. The shoe display with plug-in hybrid pins technology provides the performance of a functional modular display system while bringing the merchandise to the forefront without any obtrusive display design elements. Most of our shoe display systems can be assembled in minutes, and require no technical knowledge. Assembly videos provide assistance if needed. For more information please call us at 877-274-9300. The basis of the LINEAR system is a simple speed frame, which is embedded horizontally into a wooden or acrylic glass panel. Along the profile, different kinds of fitting elements can be positioned flexibly on the display area. As you are used to other shop design systems by Frame Displays, your wall display can be redecorated quickly and effortlessly so that your merchandise display can be designed newly again and again. The LINEAR LED shelves offer an elegant design and a visible light at the front edge of the shelves and at the bottom surface. This allows for illumination of underlying products perfectly. 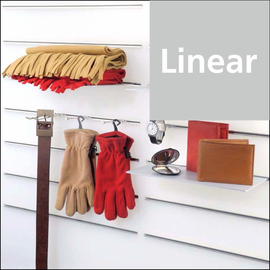 The shelves' surfaces are magnetic which allows for flexible and orderly positioning of magnetic displayers. 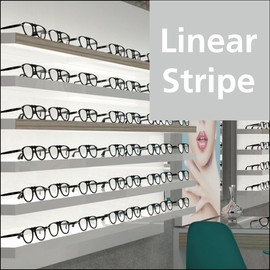 The basis of the LINEAR system is a simple extrusion, which is embedded horizontally into a wooden or acrylic panel. The system's Shelves have a built-in LED light at the bottom which illuminates underlying objects perfectly and elegantly. 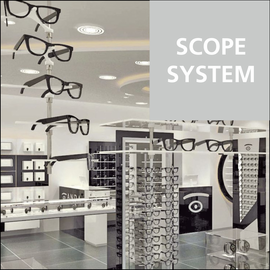 The innovative shop fitting system SCOPE offers maximum latitude for fitting and decorating shop windows or display areas. The system can be mounted onto the ceiling, floor or shop window platforms. The adapter can be easily and safely bolted to a previous mounted rail system. 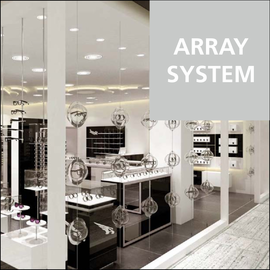 The highly scalable modular display system for shop windows can be attached direct or via its mounting rails. Individual components can be mounted onto the railing in various possible configurations. 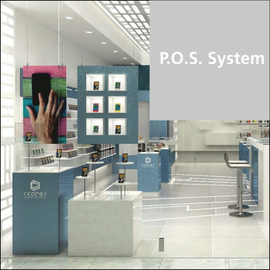 The P.O.S.-system is available for horizontal and vertical mounting. 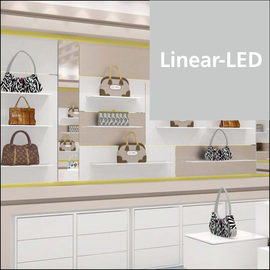 This merchandising system offers maximum flexibility for wall and shop window displays. The P.O.S. bolt can be easily inserted into an acrylic glass panel or wooden plate. CNS Displays has been developing and producing cutting-edge wall mount displays for more than ten years. Our retail displays feature the art of visual merchandising through innovative functions, unusual materials, pure and exquisite design, and absolute perfection down to the very last detail. Using modular acrylic panels, we have developed several designs that provide unique next generation wall mount shoe displays. CNS Displays designs and manufactures an extensive collection of matching window shoe displays, while offering a complete set of shoe display related products including corresponding displays for walls and counter tops. The countertop display products by CNS Displays present shoes and accessories like art. The display becomes a showcase. Our wide range of counter top shoe displays are a perfect blend of aesthetics and inventive presentation ideas. Most products are made of brushed aluminum, stainless steel, plus high grade acrylic, making them attractive and eye-catching. The exquisite, high-tech optics and various selected materials are also featured in this shoe display. The floor standing shoe display systems from CNS Displays exceed the expectations of any high-end retailer in terms of expressive trends. Our exquisite, high-tech designs and various selected materials are the core of this functional display collection. These floor standing displays are popular among commercial interior architects, store planners, creative designers, and anyone with a high expectation of aesthetics within the retail environment. The clean, sleek lines create a platform that distinctly enhances the products on display.